More and more high quality packaging is being done with plastic film materials that can be conveniently and inexpensively joined by the use of impulse heat sealing because the impulse method provides control over the cooling cycle. The final bond is made during cooling and no other system can provide a controlled cooling capability. The integrity of the package is important in most applications and is critical when packaging certain products such as food, pharmaceuticals, medical devices, and electronic components; and the integrity of the package is no greater than the integrity of the package seals. Making packages of high integrity becomes increasingly important when the need for extended shelf life and worldwide distribution create the demand for superior packages. The challenge becomes even greater when using high-speed automatic packaging machines because the time available for sealing is reduced to seconds or milliseconds. Individual product inspection is expensive, subject to human error, and sometimes virtually impossible to accomplish. It therefore follows that the sealing process must be controlled to the highest possible level to reduce the risk of defective seals and the attendant rejects, loss of product, production efficiency, and worst of all; loss of a customer. 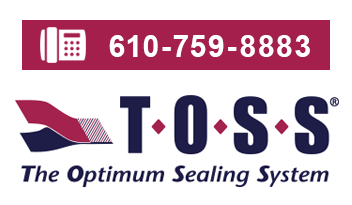 It was in response to the need for seal integrity that TOSS® - “The Optimum Sealing System” was developed, and is now available wherever perfect heat seals are required, be it product or package. When TOSS technology is employed, machines can be Certified to produce consistent and repeatable results thereby minimizing the risk of failure and reducing the dependence on inspection to assure perfection. The sealing system must be fast with controlled heating and cooling cycles that are predictable and repeatable regardless of changes in the local environment and power fluctuations. In addition, the system must have built in monitors to detect deviations from prescribed protocol and activate alarms. This is easily done on new or existing machines by installing TOSS, the Certifiable sealing system that has been designed by experts skilled in the art of producing high integrity seals. The most certain way to attain maximum efficiency and highest production rates is to call upon the experts at Toss Machine Components to get a custom designed, plug and play, system that is recognized in the industry, and accepted by monitoring agencies. The “Heart” of TOSS is the Controller that is Certified to conform to NIST standards. The Controller with its digital display and keypad can easily set-up a time- temperature program that is optimized for the material being sealed. Upper and lower limits can then be set that will activate an “Alarm” in the event the limits are exceeded. These features and more are built-in to assure safe and Certifiable performance. TOSS operates by using TOSS Alloy-20® C. Heatseal Bands that have the unique ability to be the heat source for sealing while concurrently sending an instantaneous feedback signal to the Controller for temperature regulation. This method eliminates the need for thermocouples and the inherent error and feedback delay encountered with their use. Validation is easy with TOSS because the Certified components are guaranteed to be consistent and repeatable and the heat generated over the length of the seal must be absolutely uniform as a consequence of the design. In order to facilitate machine validation Toss Machine Components can provide a helpful Validation/Certification Manual that outlines the procedure and provides necessary detailed information. Designing a high performance Heatseal System is not simple, but it is not difficult if one has some guidelines. We have tried to provide information that will aid in understanding the elements of the system that one must consider. If you are engaged in a Heatseal System design and desire assistance, call the people at TOSS. The people at TOSS are specialists in plastic heat sealing technology, equipment and related devices. They can assist you in developing improved heat seal performance on your machines, old or new. They do it every day. With TOSS Technology — it’s easy to achieve Heatseal Perfection!